The green beans the niece grew from seed in preschool yielded a handful if I saved the harvesting for about once a week. Not really enough for a stir-fry, but just enough green beans to supplement something. 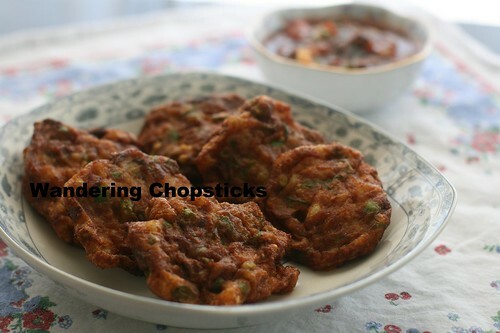 Just enough for a batch of Tod Mun Pla (Thai Fish Cakes). Remembering that Shaved Ice Sundays' in-laws are Thai, I consulted her recipe since I remembered liking her use of red curry paste in the recipe. 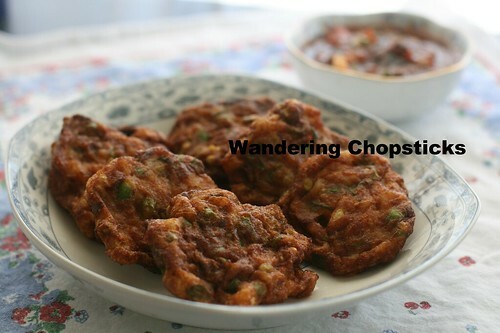 The chopped green beans I've encountered in versions of Thai fish cakes I've eaten before, adding both color and texture. 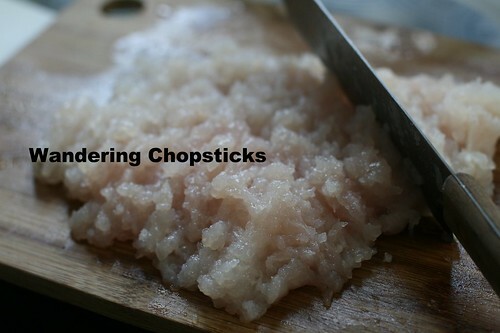 Unlike her recipe though, I minced my own fish instead of purchasing store-bought fish paste. If you buy fish paste instead of making your own, then you can probably omit most of the seasonings in my recipe since store versions already have plenty. Finally, the baking powder in the recipe helps lighten up the texture of the fish. The fish cakes will puff up a little when frying, and then shrink down in size when cooled so don't be alarmed when that happens. 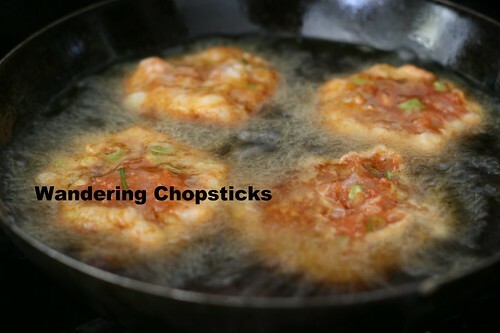 These can be eaten as an appetizer or a side dish, served with a light fish dipping sauce. 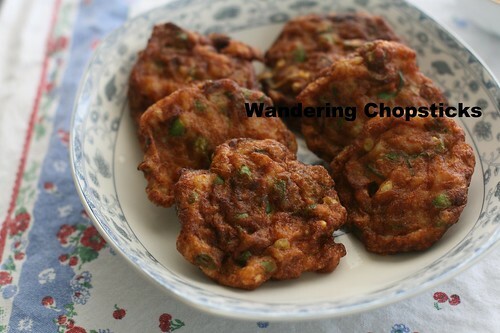 Adapted from Shaved Ice Sundays' Thai Fish Cakes (Tod Mun Pla) with Cucumber Sauce. I buy frozen basa filets and just defrost as needed, but tilapia or any white fish will do. 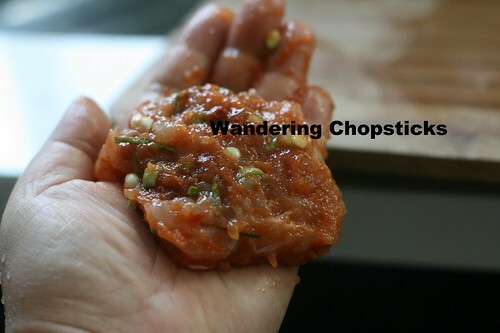 You can mince the fish in a food processor, but I find mincing fish by hand to be fairly pretty quick and easy. 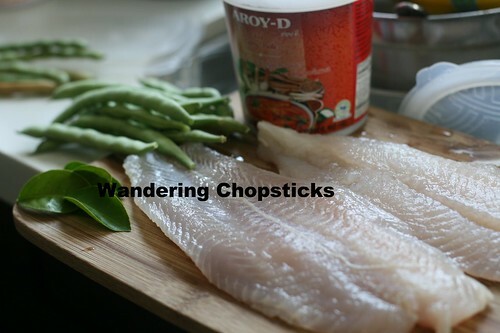 Just chop up the fish with a knife, gather up the fish in the opposite direction, and mince again. About three or four times should do the trick. 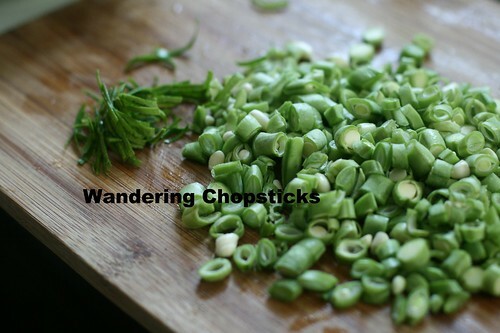 Thinly slice about 10 green beans, about 2/3 cup. Chiffonade four kaffir lime leaves. 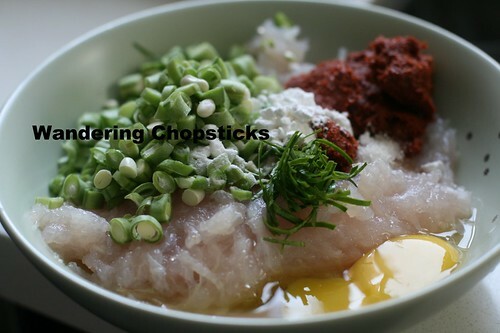 In a bowl, add the minced fish, green beans, kaffir lime leaves and 1 egg, 1 or 2 tblsps red curry paste depending on your preference, 1 tsp corn starch, 1 tsp baking powder, 1/2 tsp sugar, and 2 squirts fish sauce. The red curry paste has plenty of salt already so I didn't add more. Mix all the ingredients together. As you can tell, I used 2 tblsps of red curry paste for this lovely color. Oil your hands and form 2-inch patties. You can set the patties aside on a plate, or form them when you're ready to add them to the fryer. Fry on medium heat for about five minutes or until the patties turn golden. Flip and fry for a few minutes more. Let the patties drain the excess oil before serving. 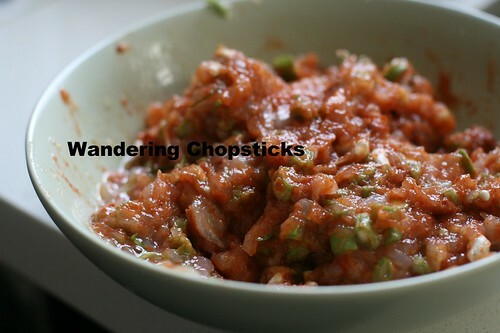 Serve with rice and Nuoc Mam Cham (Vietnamese Fish Dipping Sauce) or in my case, Laotian Roasted Tomato Salsa. 2 years ago today, Jaleo by Jose Andres ($45 Prix Fixe Menu) - The Cosmopolitan of Las Vegas - Las Vegas. 4 years ago today, Chinatown - San Francisco. 5 years ago today, Suon Kho Xa Gung Toi Ot (Vietnamese Braised Pork Chops with Lemongrass, Ginger, Garlic, and Chilies). 6 years ago today, an individual batch of Cherry Cinnamon Jam. And funnily enough, they make me think of gefilte fish (a jewish poached dumpling.) Your version can easily be tweaked for Passover! I think the Vietnamese fish paste will really make you think of gefilte fish since it's often left plain, then formed into patties and fried. Oh! How would you make it for Passover? 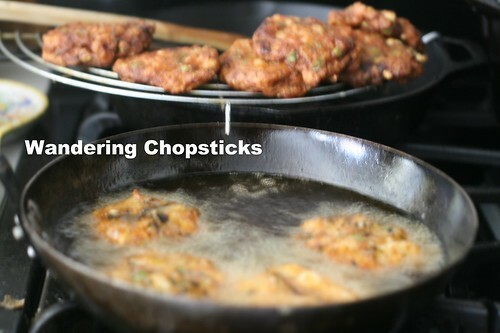 I'm really fond of thai fish cakes and have encountered so many different versions. This version looks really authentic! Thanks! I liked using red curry paste for flavor. It was also easiest that way!